TotalCrypto proposes that the case study incubator should be incorporated as a separate company and 75% of the equity should be owned by the foundations of participating crypto projects and 25% by the incubees. The 75% share allocation should mean that participating crypto projects have the right to pass any motion by special resolution by virtue of their shareholding (verification of these rights of control are required once the case study location is chosen). This means that the crypto projects involved have ultimate control of this company and the funds held within the business. 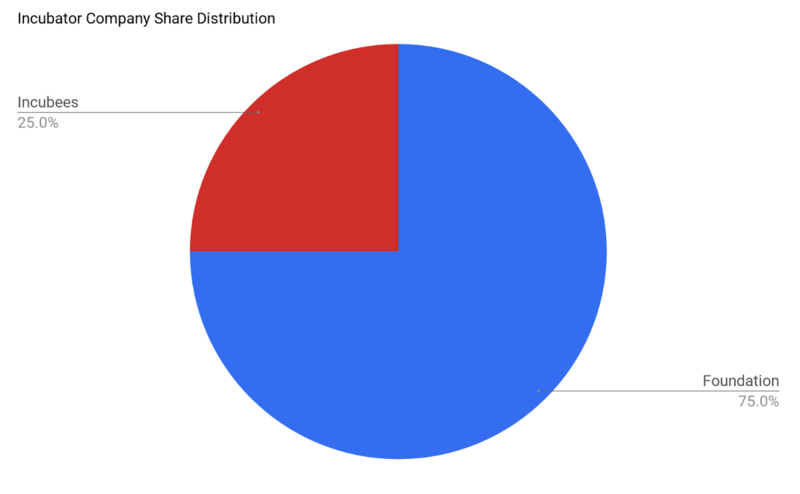 To begin with, shareholdings for each incubee will be calculated as: (100 / The number of incubees) * 25% = initial registered shareholding for each incubee. This makes the incubees stake in the incubator official and should incentivise them to make the most of this opportunity. TotalCrypto advises that shareholding redistributions should be made every 6 months to reflect the profitability of incubated businesses. In short, the more profitable a business, the higher the shareholding they would hold in the incubator company. Redistributions can be done voluntarily or the foundations of participating cryptocurrency projects can propose equity redistribution through share dilution and pass this through special resolution. It should be noted that incubees may not have the necessary documentation to be officially registered as shareholders. In such cases, TotalCrypto proposes that the de facto shareholdings should be published publicly on the websites of participating crypto projects and serve as a public record. Incubees have a vested interest in looking after the equipment. Incubees have a vested interest in protecting the equipment against theft. 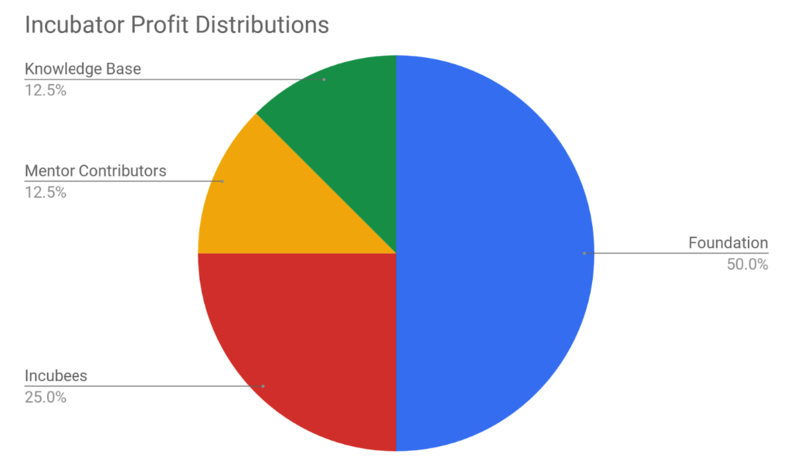 The total incubator profits (from every business unit in the incubator) in the last six months * 12.5% = knowledge base and mentor rewards (each get 12.5% of profit). In the event that incubator contributors choose to donate their cryptocurrency, then it’s advised that these funds would be used to buy additional incubator equipment, software or go towards incubees base salaries. If no new equipment is required at the time of the donation, then the foundations of participating crypto projects should take custody of these funds and store them in a single wallet. This wallet address should be made publicly available to ensure transparency, so that the community can monitor how these funds are used. It’s proposed that donated funds can be allocated to new equipment by a vote held using platforms like Survey Monkey or ClearPoll. In the week before the vote, anyone in the incubator can submit a piece of equipment for approval. The vote would be anonymous and can be managed by the TotalCrypto team. Only one vote per email address would be allowed to prevent plural voting. In event a incubator business unit was sold, then it’s recommended that 25% of the sale price would be distributed to incubator contributors as a reward. The local team working on the project should also receive 25% of the sale price in the cryptocurrency of the participating crypto project and the remainder of the sale price would be allocated back to the foundation in the projects own coin. This claw back of coins is essential to make further case studies viable. TotalCrypto proposes that it would be the responsibility of the participating crypto projects to pay out these promised incubator contributor rewards and this agreement is made between incubator contributors and the incubator company. (Business unit turnover / Total Incubator turnover) * (25% of the share units in the company) / (number of people in the business unit) = shareholding allocation for each incubee in the business unit. This recommendation means that incubator companies that are generating the most revenue will hold a greater share allocation and will be entitled to a bigger profit distribution.